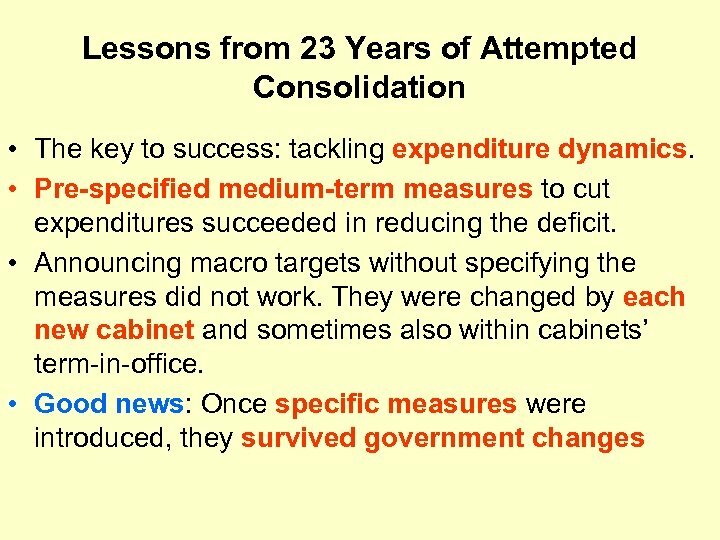 Background § Since the 1985 stabilization, governments repeatedly stated a commitment to fiscal consolidation. 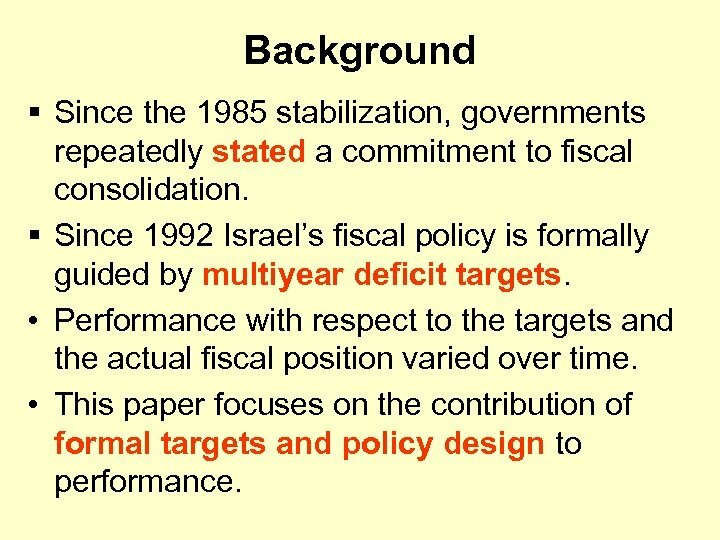 § Since 1992 Israel’s fiscal policy is formally guided by multiyear deficit targets. • Performance with respect to the targets and the actual fiscal position varied over time. • This paper focuses on the contribution of formal targets and policy design to performance. 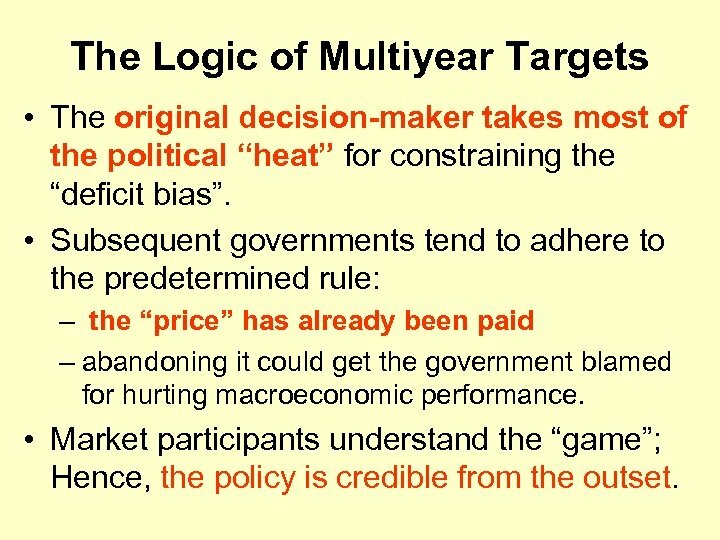 The Logic of Multiyear Targets • The original decision-maker takes most of the political “heat” for constraining the “deficit bias”. • Subsequent governments tend to adhere to the predetermined rule: – the “price” has already been paid – abandoning it could get the government blamed for hurting macroeconomic performance. • Market participants understand the “game”; Hence, the policy is credible from the outset. 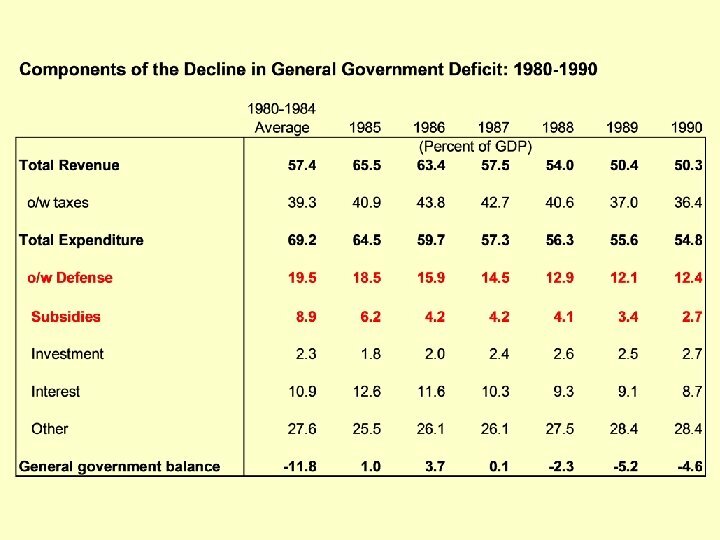 Underlying Questions • Does the public really like deficits? – No such evidence in the literature – Doesn’t really make sense (rationality). 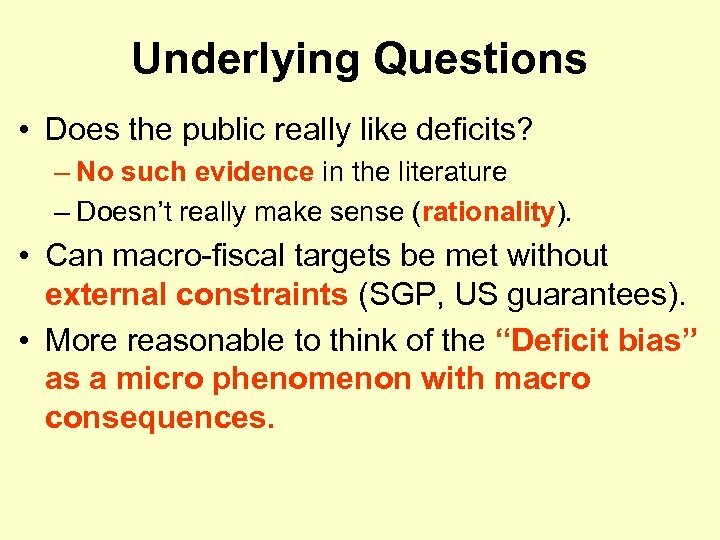 • Can macro-fiscal targets be met without external constraints (SGP, US guarantees). • More reasonable to think of the “Deficit bias” as a micro phenomenon with macro consequences. Pre-Specified Measures or Macro Targets? Policy-makers need to confront interest groups on specific budget items. Setting macro-fiscal targets leaves the “real battle” - approving and implementing the required measures - to future policy-makers. 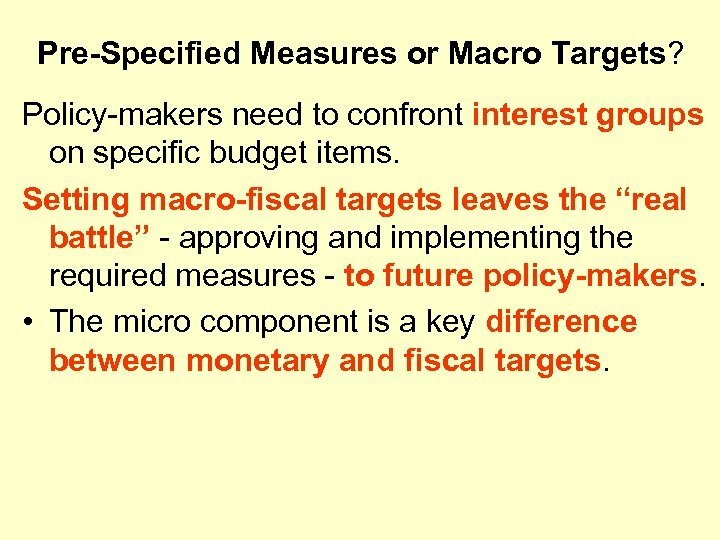 • The micro component is a key difference between monetary and fiscal targets. 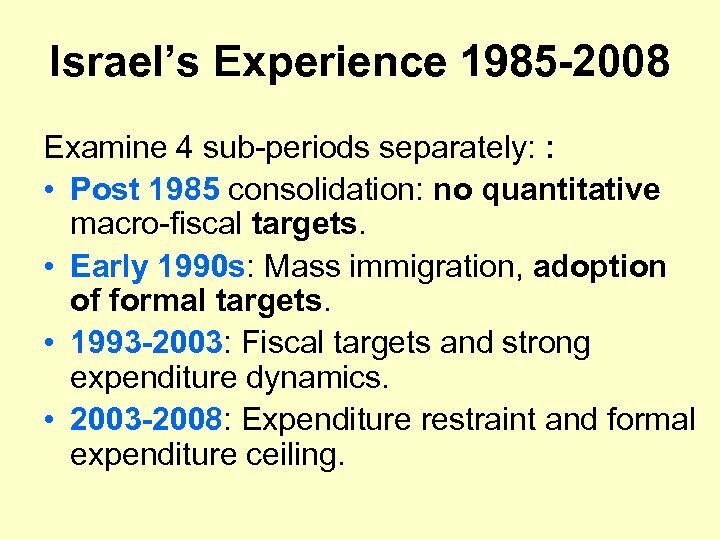 Israel’s Experience 1985 -2008 Examine 4 sub-periods separately: : • Post 1985 consolidation: no quantitative macro-fiscal targets. • Early 1990 s: Mass immigration, adoption of formal targets. 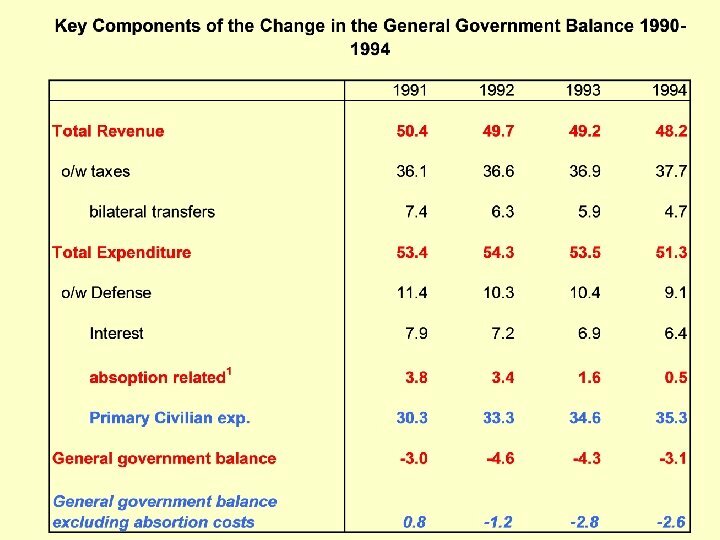 • 1993 -2003: Fiscal targets and strong expenditure dynamics. 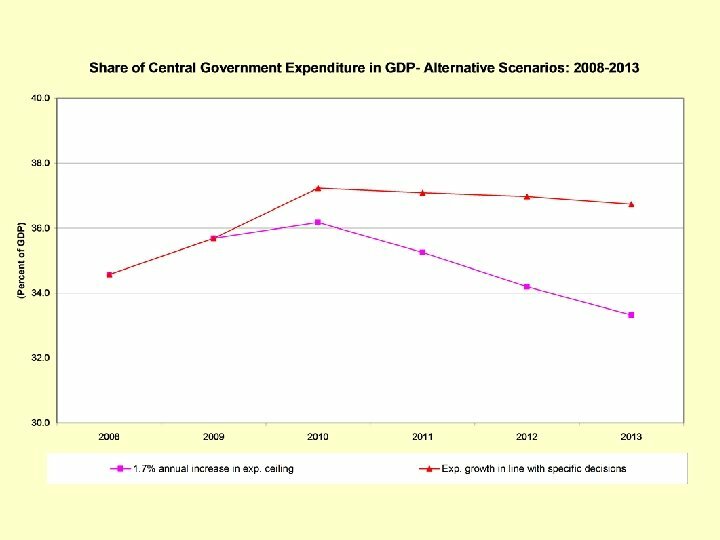 • 2003 -2008: Expenditure restraint and formal expenditure ceiling. 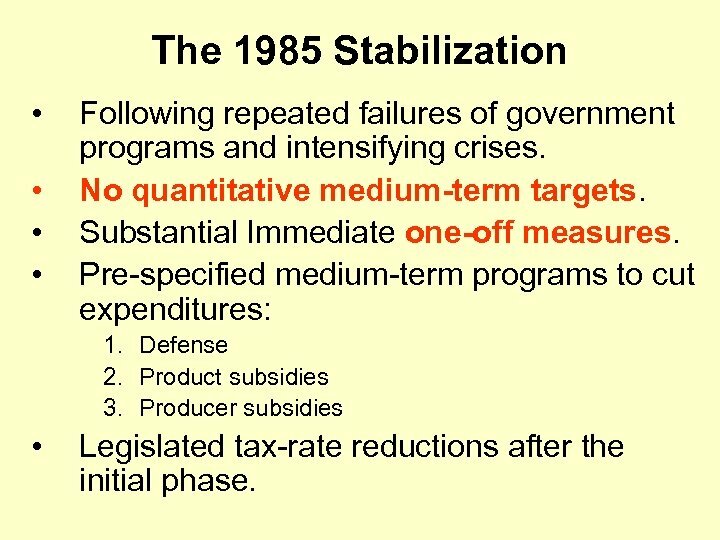 The 1985 Stabilization • • Following repeated failures of government programs and intensifying crises. No quantitative medium-term targets. Substantial Immediate one-off measures. Pre-specified medium-term programs to cut expenditures: 1. Defense 2. Product subsidies 3. Producer subsidies • Legislated tax-rate reductions after the initial phase. 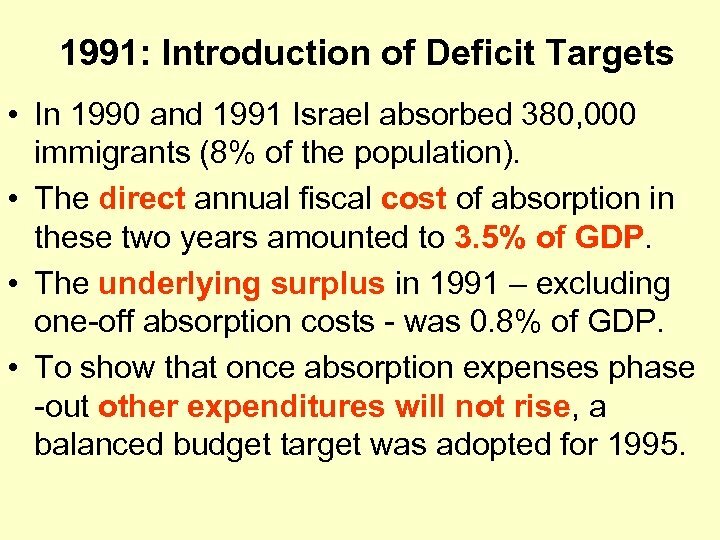 1991: Introduction of Deficit Targets • In 1990 and 1991 Israel absorbed 380, 000 immigrants (8% of the population). • The direct annual fiscal cost of absorption in these two years amounted to 3. 5% of GDP. • The underlying surplus in 1991 – excluding one-off absorption costs - was 0. 8% of GDP. • To show that once absorption expenses phase -out other expenditures will not rise, a balanced budget target was adopted for 1995. 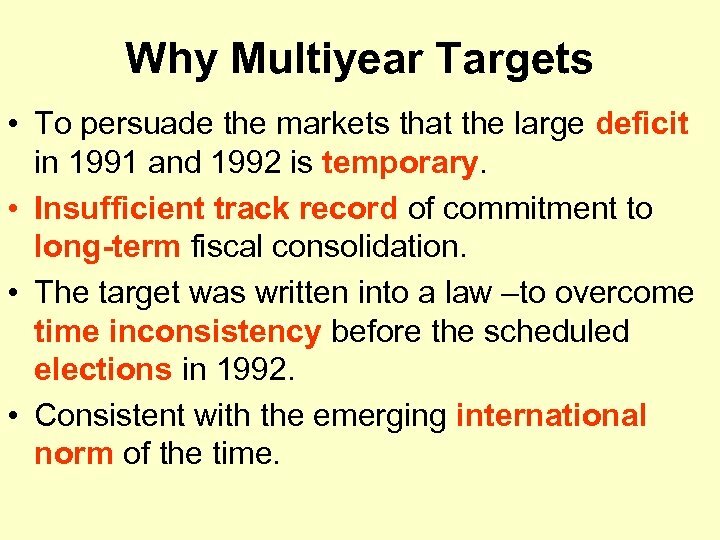 Why Multiyear Targets • To persuade the markets that the large deficit in 1991 and 1992 is temporary. • Insufficient track record of commitment to long-term fiscal consolidation. • The target was written into a law –to overcome time inconsistency before the scheduled elections in 1992. • Consistent with the emerging international norm of the time. 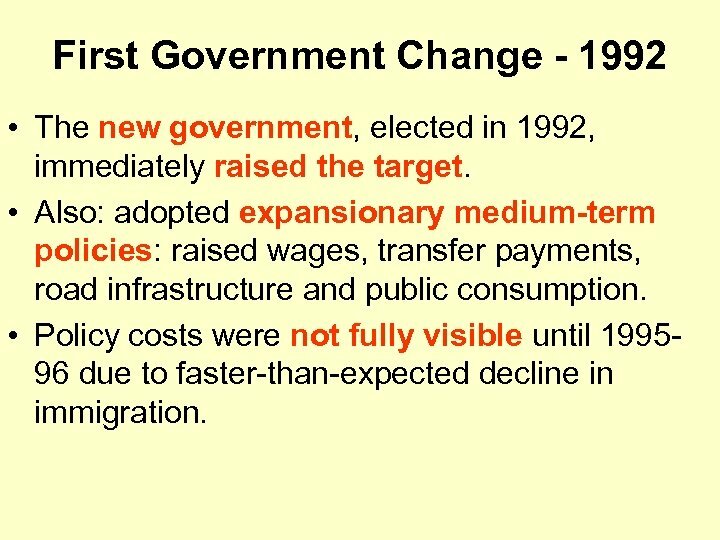 First Government Change - 1992 • The new government, elected in 1992, immediately raised the target. • Also: adopted expansionary medium-term policies: raised wages, transfer payments, road infrastructure and public consumption. • Policy costs were not fully visible until 199596 due to faster-than-expected decline in immigration. 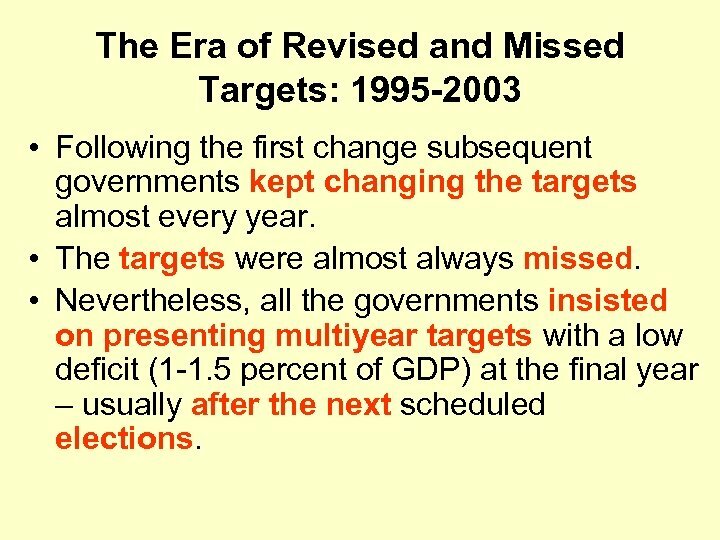 The Era of Revised and Missed Targets: 1995 -2003 • Following the first change subsequent governments kept changing the targets almost every year. • The targets were almost always missed. • Nevertheless, all the governments insisted on presenting multiyear targets with a low deficit (1 -1. 5 percent of GDP) at the final year – usually after the next scheduled elections. 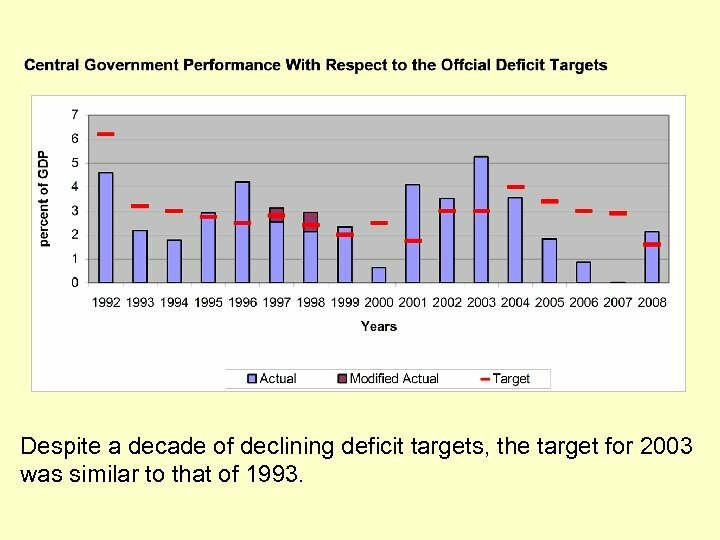 Despite a decade of declining deficit targets, the target for 2003 was similar to that of 1993. 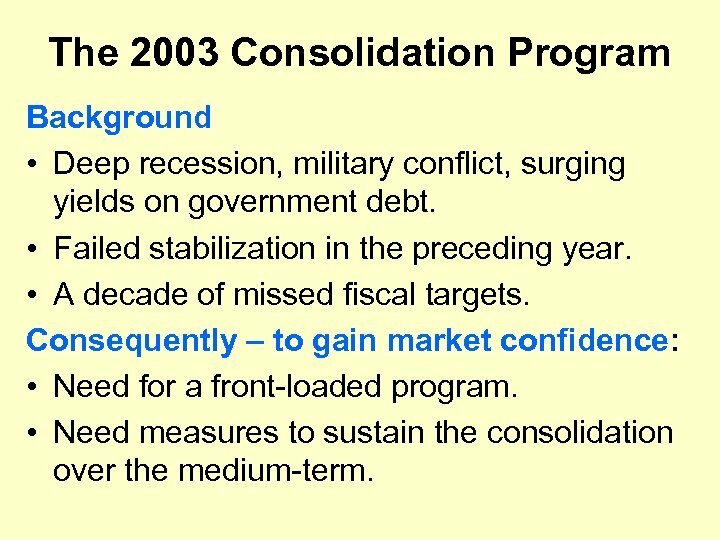 The 2003 Consolidation Program Background • Deep recession, military conflict, surging yields on government debt. • Failed stabilization in the preceding year. • A decade of missed fiscal targets. Consequently – to gain market confidence: • Need for a front-loaded program. • Need measures to sustain the consolidation over the medium-term. 1 All the scenarios assumed the same interest rate and 4 percent annual growth. All figures are adjusted to the current GDP definition. 2 Based on specific measures adopted with the 2004 budget. 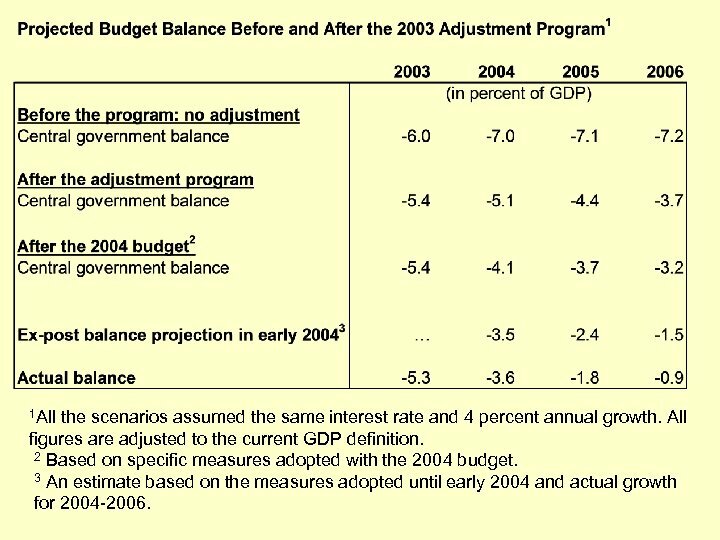 3 An estimate based on the measures adopted until early 2004 and actual growth for 2004 -2006. 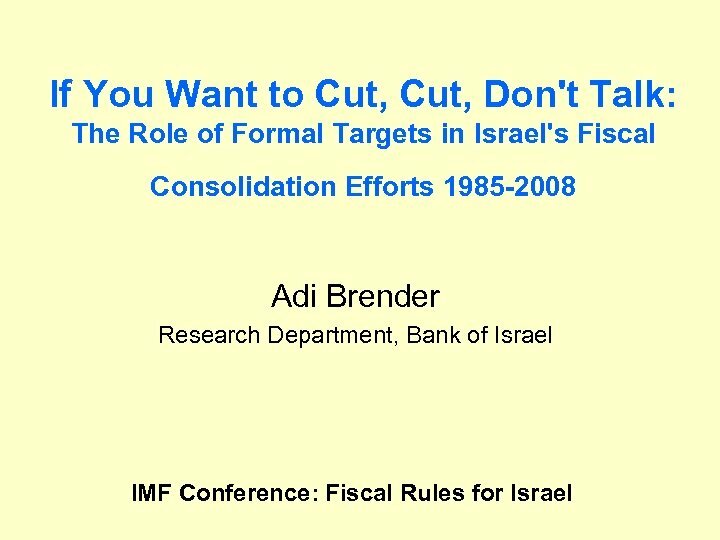 The Role of Targets: 2003 Consolidation • In 2003 the deficit target was abandoned. 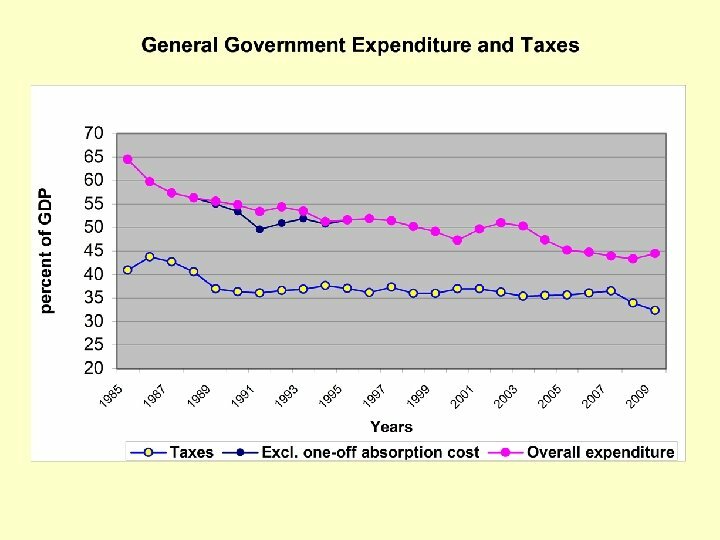 • Expenditure ceiling: introduced in 2005 but was changed several times. In no year was the budget in accordance with the ceiling. • Actual expenditure was well below the budget due to administrative measures affected since 2003. • Since 2006: tax cuts offset expenditure cuts. 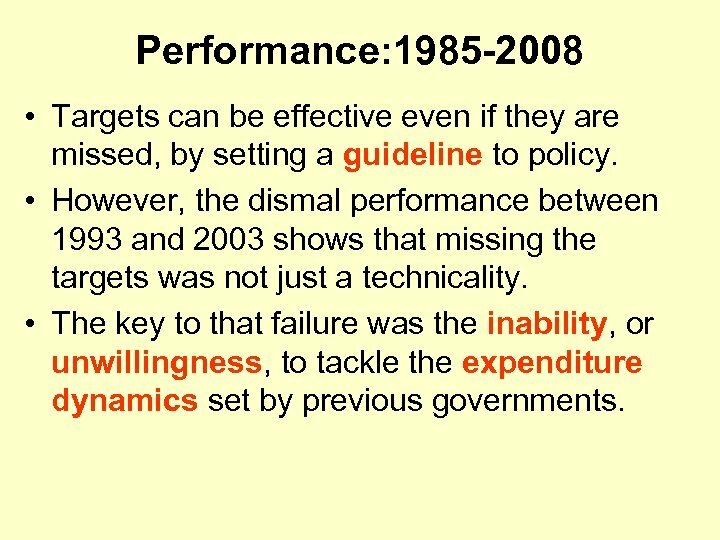 Performance: 1985 -2008 • Targets can be effective even if they are missed, by setting a guideline to policy. 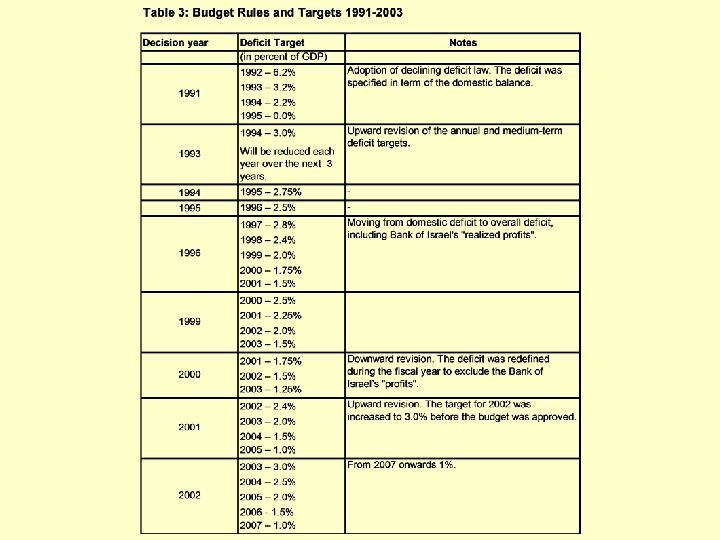 • However, the dismal performance between 1993 and 2003 shows that missing the targets was not just a technicality. • The key to that failure was the inability, or unwillingness, to tackle the expenditure dynamics set by previous governments. Lessons (Cont. ) • Bad News: successful programs were implemented in times of crisis and after failed attempts with less comprehensive ones. 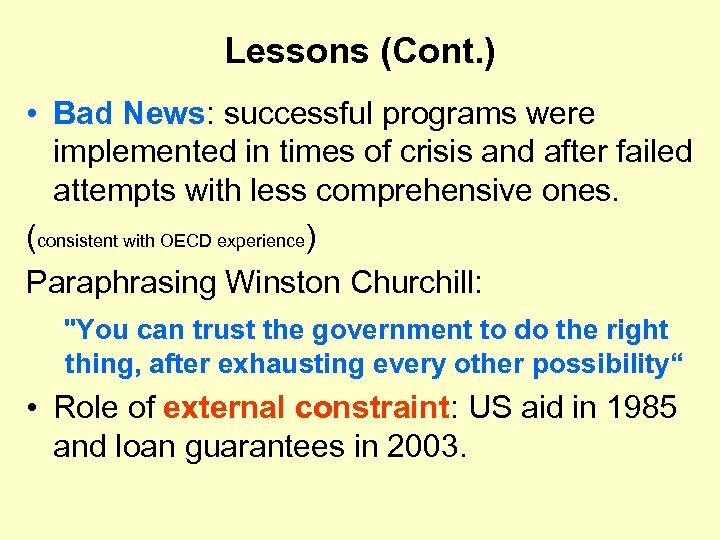 (consistent with OECD experience) Paraphrasing Winston Churchill: "You can trust the government to do the right thing, after exhausting every other possibility“ • Role of external constraint: US aid in 1985 and loan guarantees in 2003. 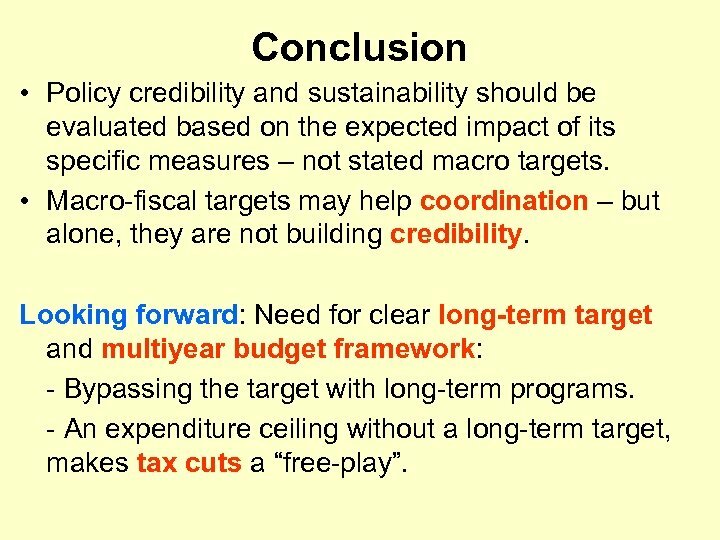 Conclusion • Policy credibility and sustainability should be evaluated based on the expected impact of its specific measures – not stated macro targets. • Macro-fiscal targets may help coordination – but alone, they are not building credibility. Looking forward: Need for clear long-term target and multiyear budget framework: - Bypassing the target with long-term programs. - An expenditure ceiling without a long-term target, makes tax cuts a “free-play”.